^ Martha Fodaski Black (1995). Shaw and Joyce: "The Last Word in Stolentelling". University Press of Florida. pp. p.100. ISBN 0813013283. ^ George Bernard Shaw, Shaw on Shakespeare. Ed. Edwin Wilson. London: Cassell,1961, p. 180. ^ Shaw, Bernard, edited by Samuel A. Weiss (1986). Bernard Shaw's Letters to Siegfried Trebitsch. Stanford, Calif.: Stanford University Press. ISBN 0-8047-1257-3, p.164. ^ "Herr G.B. Shaw at the Irving Place." The New York Times 25 March 1914. ^ Laurence, editor, Dan (1985). Bernard Shaw: Collected Letters, 1911–1925. New York: Viking. pp. 228. ISBN 0-670-80545-9. 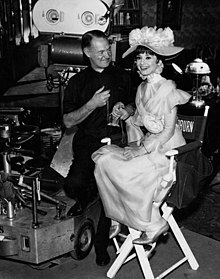 ^ a b Dent, Alan (1961). Mrs. Patrick Campbell. London: Museum Press Limited. ^ Evans, T.F. (ed.) (1997). George Bernard Shaw (The Critical Heritage Series). ISBN 0-415-15953-9, pp. 223–30. ^ Shaw, Bernard, edited by Dan H. Laurence. Collected Letters vol. III: 1911–1925. ^ Shaw, G.B. 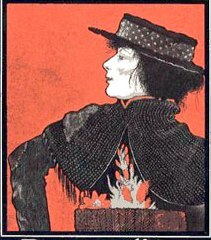 (1916). 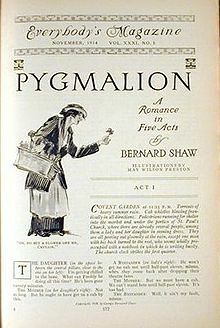 Pygmalion. New York: Brentano. Sequel: What Happened Afterwards. Bartleby: Great Books Online. ^ Pascal, Valerie, The Disciple and His Devil, McGraw-hill, 1970. p. 83."